Leipzig/Ingolstadt, 11.02.2019: DreamHack will be held at the Leipziger Messe expo centre from 15 to 17 February 2019 – and video games fans from all over Germany are looking forward to this first-rate gaming event! DreamHack has become firmly established over the past few years with attendance growing year after year. And one major attraction is the DreamStore powered by MediaMarkt, now on hand for the fourth year in a row. Under the motto “Where Gamers’ Dreams Come True – Perfect Prices for Prolific Players”, fans will once again have an opportunity to choose from a wide selection of gaming products from renowned manufacturers at very special prices. Visitors are attracted to this three-day gaming festival by Germany’s biggest LAN party, professional eSports tournaments, an exhibition of the latest hardware and software, and a cosplay contest. This year, too, in the midst of all this, MediaMarkt is setting up its DreamStore more than 400 square metres in size. And with its fantastic selection of items and spectacular special offers, it’s a real treasure trove for gaming fans! The DreamStore has everything on board to put gamers on cloud nine: powerful gaming PCs and laptops, games consoles, special monitors and chairs, and components such as graphics cards, power supply units, hard drives and PC cooling systems, as well as tons of mice, controllers, keyboards, headsets and other accessories. There’s also a huge selection of games and software. And in addition, the DreamStore stocks a huge range of merchandise related to the most popular games. 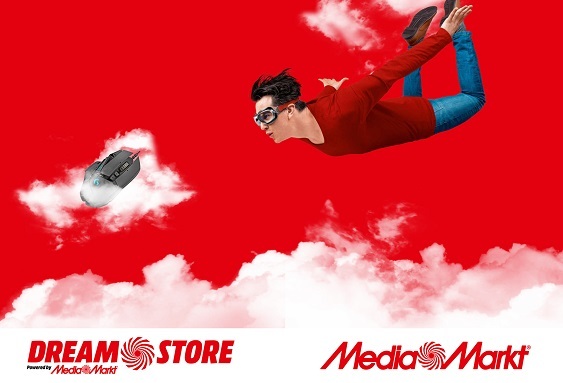 The DreamStore powered by MediaMarkt is a genuine shopping paradise selling everything gamers need to perfect their setup – for very special expo prices!